New teams in baseball have to pay dues before they enjoy success at the major league level. The amount varies from team to team. For the New York Mets, it was eight years of player development and growing pains; for Houston and San Diego it was much longer. On the other hand, Florida and Arizona enjoyed relatively quick success. The Tampa Bay Rays opted to draft talented high school players such as Carl Crawford, Josh Hamilton, Rocco Baldelli and B.J. Upton. While they matured in the minors, the product in the majors suffered. For years, local politicians and business leaders in St. Petersburg and Tampa tried to win a baseball franchise for central Florida. They made a heavy play for one of the expansion franchises in 1993, but lost to Denver and Miami. Having already built a domed stadium, these local leaders tried to lure the Chicago White Sox and later the San Francisco Giants to the Sunshine State. Both deals fell apart. Ironically, when the area was awarded a franchise for the 1998 season, the team was named for Tampa Bay although the domed stadium, now called Tropicana Field, is in St. Petersburg. The Tampa Bay Devil Rays opened for business March 31, 1998, losing to the Detroit Tigers 11-6. The next day they scored their first-ever win, 11-8 against the same Tigers. The Devil Rays went for experience and veteran presence on their expansion roster, going for names such as Wade Boggs, Fred McGriff, Paul Sorrento, Wilson Alvarez and Roberto Hernandez. That strategy did not work. In fact, almost nothing Tampa Bay tried worked, finishing last in the American League East its first six seasons. The low point was a 55-106 record in 2002. Boggs and McGriff provided a few franchise highlights. Boggs recorded his 3,000th hit at Tropicana Field on August 7, 1999. It was a home run, making Boggs the first member of this exclusive club to homer for his milestone hit. McGriff had a stellar 1999 season for the Rays (32 home runs, 104 RBIs, .310 average) and hit his 400th career home run on June 2, 2000 against the Mets at Shea Stadium. In September of that year, McGriff hits his 200th career home run in the American League, making he and Frank Robinson the only two players to hit at least 200 homers in each league. After five consecutive last place finishes, the Devil Rays hired hometown product Lou Piniella to manage for the 2003 season. In his first year the Rays made it six in a row in the cellar with 99 loses. In 2004, Piniella began to show some results, forging the team's young talent into a 42-41 record halfway through the season. The team's lack of depth caught up to it in the second half and it finished 70-91, but that was good for fourth place in the American League East. Among the young talent Piniella helped develop was Aubrey Huff, who hit .313 in 2002, then hit his stride in 2003 (34 home runs, 107 RBIs, .311 average) and 2004 (29 homers, 104 RBI batted in, .297) and the dynamic Crawford, who became a .301 hitter in 2005 and stole 55, 59 and 46 bases in his first three seasons. After the strong first half and the fourth place finish in 2004, expectations were higher for 2005. The Devil Rays failed to deliver, regressing to a 67-95 record. A bright spot was Jorge Cantu, who burst on the scene with 28 home runs and 117 RBIs. Rookie Johnny Gomes also whacked 21 homers. However, Piniella resigned at season's end, sighting what he perceived as the team's lack of commitment to winning. What's in a name change? How about immediate success and a truly amazing Cinderella season. The Rays dropped the Devil from their name officially in 2008 and throughout the season were a devil of a team to beat, not only recording their first winning season, but advancing all the way to the World Series before losing to Philadelphia. They continued their new found success in 2010, winning the rugged American League East for the second time in three seasons. At 29, Crawford was the graybeard among youthful stars such as Upton in center, third baseman Evan Longoria and pitchers David Price, James Shields, Jeff Niemann and Wade Davis. A key trade with Minnesota prior to the 2008 season also brought cagey shortstop Jason Bartlett and hard-throwing right-hander Matt Garza, who pitched the first no-hitter in franchise history in 2010. 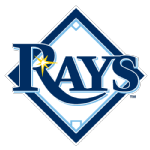 SERIOUS Tampa Bay Rays fans should take part in the Rays discussion forum today and learn about rumors, breaking news, records and team related trivia. The Tampa Bay Rays played their first Major League game on March 31, 1998 . Their opponent was the Detroit Tigers who quickly took an 11-to-0 lead before the Rays attempted a rally only to lose 11-to-6. During the 2000 season a new three million dollar part-artificial turf, the first of its kind, was installed in Tropicana Field to reduce injuries.